This entry was posted in education, Letters to Cuomo, parents, rant, Student Heroes. Bookmark the permalink. What I love most about Josh’s letter is how he has used the common core skill of persuasive writing against the reformers. Brillant piece from Poetic Justice and a brave young student activist. Thank you for allowing War Report to reblog this piece. I honestly always liked the week of aptitude and achievement testing in school, but it was easy for me to since I’d end up getting results about being in the 98th or 99th percentile on all these different subjects and that’s most gratifying. And filling out bubbles is so nice. Preparing for them, though, that’s just crazy. The point is a tolerably standard assessment of what the students are doing, not to cram for them. I posted my daughter’s letter on Facebook and since she was articulate the letter was slammed as not being authentic. Josh did a nice job. Well done young man. 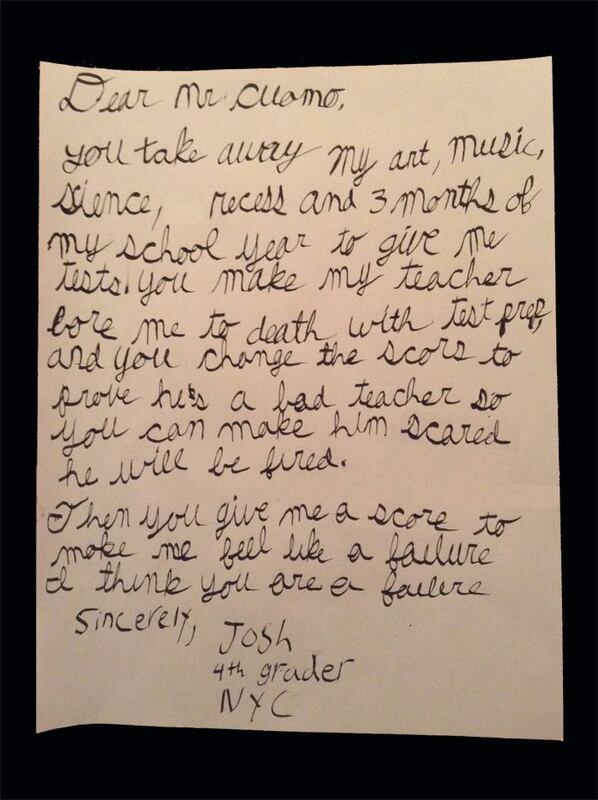 Bravo to you Josh and dad for sharing your voice in reference to what is happening in our education system. Dad, you are correct in cuts in funding and how it has affected our kids. As all parent wants for their child is access to quality education and programming. We have all put in tireless hours fundraising so our children do have access to what are government should be paying for. Those individuals so far removed from the classroom and what is going to make our students motivated and to excel in control… continues to be frightening and destructive. Where does all that money go?? People making school/ classroom decisions should have experience in the classroom and communities. Students First!!! The tax payers in NY know full well how much they pay in taxes. Why are subjects being taken away when the money is there?? And, if the money isn’t there, where is it all?? In deep pockets?? It’s sad to see how easy it is to take away things from the children… but take away things from the teachers?? Forget it!! We always hear from the NYS teachers unions about why school taxes are so high… ‘it’s for the kids’… right?? Well, prove it!! Show us!! Show us how much you’ll give up BEFORE taking something away from the kids!! CJ i dont think teachers are taking anything from the kids. You dont go into teaching to make a lot of money. They are giving, as are the parents. Where is the money going? Its a huge system, is there waste? of course, but when you cut school budgets year after year after year, you end up with less and less. Meanwhile the infrastructure ages and ages, and the costs go up. We had many years where tax revenues were down, support from the state withheld. We treat schools like baby sitters. We want to pay as little as possible for an incredibly difficult and important job. CJ, what do you want us to give up? I teach for New York City public schools. Many of us commuted for several hours in dangerous conditions to get in to teach the children this week. I leave my house by 6 a.m. and will not get home until close to 7 tonight, somewhere between 8 and 9 tomorrow, etc. because I’m staying after school for hours to assist students for free. I spend my own money on supplies for the students, even though I am living from paycheck to paycheck on how little I am paid. I am not provided with a printer, paper, classroom, or various other basic teaching materials. I spend time outside of school planning intricately detailed lesson plans, grading, and calling parents. I have given up time when I could have been working a second job making some money to help me afford to live (since my pay is low -even though I am required to have a master’s and constantly be spending more money and time on further studies and professional development just to keep my license) to stay after school to help students with events and projects, as well as to talk with parents/etc. I guarantee you that teachers are not pocketing the money… But if we have such a sweet deal, maybe you should become a teacher! Educate yourself.